The good news is in and it comes from Gardena, California. Our Panthers are making us proud! The school-wide graduation rate for Gardena High School’s senior class of 2013 stood at an impressive 80%. Now add an ITEP sponsored academy into the student mix, and the rate jumps to 85%! 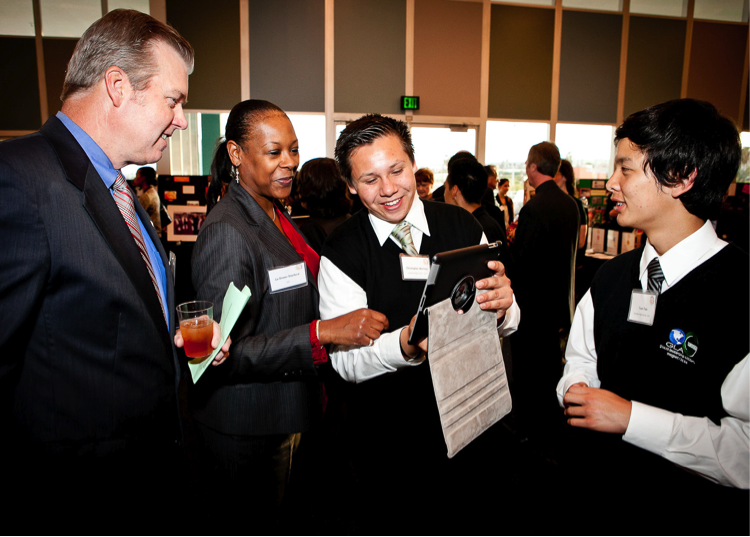 GGLA students network with UPS executives during ITEP’s 2013 Scholarship Dinner. Gardena High’s Global Leadership Academy (GGLA) not only boasted a higher graduation rate among all seniors, but was also the Small Learning Community (SLC) with the largest graduating senior class. See stats below. “We want every student at Gardena High School to gain proficiency in every subject and become fully prepared for college. The Global Leadership Academy helps students improve academically and socially. It also helps students develop career goals and gain confidence in themselves. The teachers in our Global Leadership Academy are doing an excellent job to help our students achieve at high levels. Their hard work is having a positive effect on the entire school,” said Gardena High School Principal, Dr. Russ Thompson. The high school also saw improved California Standards Tests scores in the areas of English 9, English 10, Algebra 2, Summative Math, Chemistry, and World History. We’d like to congratulate Gardena High School – students, teachers and administrators for their academic success. By allowing us to work in their campus and with their talented Panthers, we’re working together to make LAUSD schools better and bring additional pride to the community. GGLA students and Advisory Board Members take a fun pose during ITEP’s 2013 Scholarship Dinner. Feeling inspired? Show your pride and support for GLA by emailing this post to a friend/ colleague, or share it on Twitter or Facebook.